The Duchess of Cornwall has attended a service at Blackpool's cenotaph to celebrate the contribution of the UK's armed forces on National Veterans' Day. She began her first official visit to the resort by watching Falklands War veteran Anthony Barlow, 62, abseiling 518ft (158m) down Blackpool tower. She later met Henry Allingham, 112, - the oldest surviving veteran of World War I. A two-minute silence followed the service led by the Bishop of Blackburn. The Duchess of Cornwall presented a number of veterans' badges, including one to former BBC war correspondent Martin Bell, who spent two years of his youth on national service. Earlier, in a special stunt, another veteran dived to the bottom of a shark tank at Blackpool Sea Life Centre to retrieve his badge. John Phillips, who lost his arm while trying to disable an unexploded bomb on board HMS Antelope in the Falklands, said: "Veterans' Day is a marvellous initiative because it brings all those who have served together. "I think people are more and more appreciative because of Afghanistan and Iraq in the news every day. "They're more aware of what people have done." 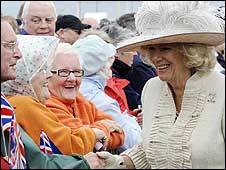 Simon Brown, who was shot in the face in Basra, was pleased the Duchess of Cornwall remembered him from a previous meeting. Mr Brown, 29, from Leeds, said: "She remembered my story and asked if things were looking up. She's got a good memory." "Veterans' Day helps raise our profile. "People are starting to get behind us because of reports in Iraq and Afghanistan. "They appreciate how hard the work is. People didn't understand what was going on before." The service was being led by the Bishop of Blackburn, Rt Rev Nicholas Reade. 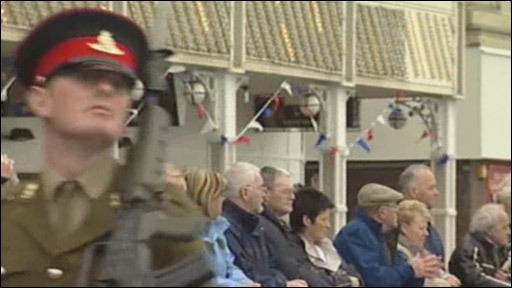 Blackpool has been holding its own annual Veterans' Week since 2005 and beat four other UK cities to be named the host of national 2008 event. It celebrates the contribution made by all those who have served in the Armed Forces and raises awareness of veterans' issues. Veterans Minister Derek Twigg and the Chief of the General Staff, General Sir Richard Dannatt, also attended.